Fire-bellied toads are any of the species of toads belonging to the taxonomic family Bombinatoridae. Other common names include ‘firebelly toad’ and ‘firebellied toad’. Unlike the other toads and frogs, fire-bellied toads cannot fold out their disc-shaped tongue. This unique feature cause them to classified formerly under the family discoglossidae, instead they now have their own family name; Bombinatoridae. 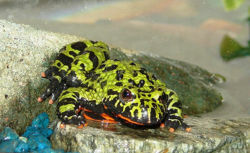 Fire-bellied toads discover across much of Asia and Europe, near the shore or staying in water. They are mostly active while the temperature reaches about 16~20°C (60°F) degrees. During the day, they spend most of their time hunting for foods in the water around the shore. During the night time, when there are more moistures in the air, they move onto ground to continue hunting. During the bad weather, windy or cold, their activity abilities get decreased. From early autumn to late spring, they hibernate in mud at the bottom of ground or ponds. Undoubtedly, fire-bellied toads display the unbroken reaction when endangered. Although they are covered with toxic skin, they still have lots of predators. Fire-bellied toad Introduction by Multiple authors. Wikipedia. This page was last modified on 3 February 2011, at 21:54.